CAMBRIDGE — Hundreds of students, community members, and professors gathered in Harvard Square Monday afternoon to protest the grand jury decision not to indict a Ferguson, Mo., police officer in the shooting death of an unarmed black teenager in August. The protest began as several separate “walkouts” at Cambridge Rindge and Latin School, Harvard College, and Harvard Law School. The three groups converged at Harvard Square just before 1:30 p.m., where State Police spokesman David Procopio said there were about 700 people. The protest went off peacefully; Cambridge police spokesman Jeremy Warnick said no arrests were made. The organizers led chants such as “black lives matter” and “no justice, no peace, no racist police,” as well as the “hands up, don’t shoot” mantra that has become indicative of Ferguson-related protests across the country. Dozens of protesters lay in the street, outlined in chalk to resemble bodies at a crime scene. This “die-in” demonstration blocked traffic along Massachusetts Avenue and Brattle Street just in front of the Harvard Square T Station. Cambridge police redirected traffic throughout the protest. On Aug. 9, Ferguson police Officer Darren Wilson fatally shot Michael Brown, who was unarmed. A grand jury announced its decision not to indict Wilson on Nov. 24. He has since resigned. The grand jury’s announcement led to protests in cities across the country, including Boston, where as many as 1,400 people marched last Tuesday night. On Monday in Harvard Yard, John Johnson, 37, a Harvard College professor, led a small group who later joined the gathering in Harvard Square. The crowd dispersed shortly before 2 p.m., when the Rindge and Latin students, who made up the majority of the protesters, began their march back to the high school. Mary Gashaw, 15, co-organized the walkout from Rindge and Latin with another student. “We can’t be in a classroom when our people are being murdered in the streets,” Gashaw said in a telephone interview. “Tomorrow we’re going to have a meeting with the principal to see what needs to be done to address racism” at the school. Several other Massachusetts schools joined in walkouts Monday afternoon, including Boston University, where a group of 50 to 70 students gathered at Marsh Plaza for about 30 minutes, said Boston University police Captain Robert Molloy. Molloy said a group of about 200 students marched from Fenway High School to the BU Bridge before turning around and marching back to Kenmore Square. Procopio said State Police aided Cambridge and Boston police in keeping protesters from blocking Memorial Drive, Storrow Drive, and the Massachusetts Avenue Bridge — but the protesters did not attempt to block the roads. “It was very orderly,” Procopio said. Protests also took place at Boston College, Worcester State University, and Clark University. 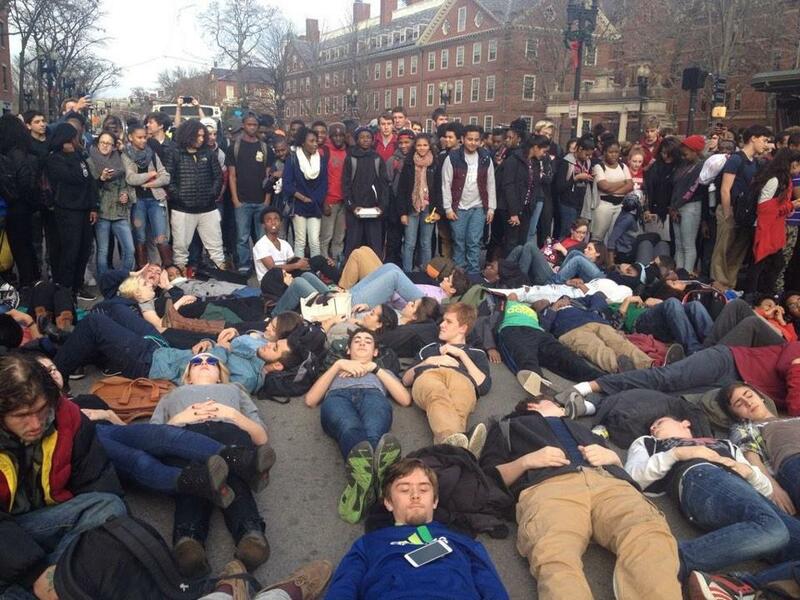 Dozens lay in the center of Massachusetts Avenue. Globe correspondent Trisha Thadani contributed to this report. Kiera Blessing can be reached at kiera.blessing@globe.com.